In the years before the first world war raged over Europe, Mercedes had established itself as a leading racing car manufacturer; in 1914 a Mercedes won the French Grand Prix and a year later a similar car took a victory in the Indy 500. Despite the grim financial situation in Germany after the war, Mercedes was keen to take up racing once again. To cut costs the competition cars of the early 1920s shared many parts with the contemporary road cars and with the earlier racers. During the war the Stuttgart based company had learned valuable lessons in the then novel idea of forced induction thanks to the production of airplane engines. By 1922 the Roots-Type Supercharger had become standard equipment on Mercedes' racing cars. With the arrival of the talented Austrian designer Ferdinand Porsche the successes returned starting with a win in the 1924 Targa Florio. Porsche's first clean sheet design was built to the two-litre Grand Prix regulations and featured a twin-cam eight cylinder engine. It was quickly left obsolete as the rules changed at the end of the 1925 season. The young Austrian's next task was to design a new supercharged engine for a new range of luxury models launched late in 1924. Dubbed the 400 and 630, the two new machines were equipped with six cylinder engines of 4 and 6.3 litre displacement respectively. Both engines were fitted with an engageable Supercharger, which only worked when the acceleration pedal was fully depressed. This was a compromise to have the power available when really needed and still minimize the stress on the engine. Within a year, Porsche had reworked the 630 into a racing car with a similar engine, but with a shorter chassis. After the new chassis dimensions, the new racer was named K for Kurz or Short. After the merger with Benz in 1926, a completely new chassis was developed for the potent engine. It was significantly lower than the original K chassis to increase the handling characteristics of the heavy machine. Again for obvious reasons this new car was known as the S for Sport. To further improve the performance the engine displacement was increased to 6.7 litres, yielding 225 bhp with the 'Elephant' Supercharger engaged and enough torque to move a house. The six cylinder engine now also sported a cylinder block constructed of silumin; a very light and strong alloy of aluminium and silicon. Rudolph Caracciola showcased the 'White Elephant's' capabilities with a convincing victory at the opening race of the Nürburgring in 1927. For the 1928 season an even larger version of the engine was developed by increasing the bore to a staggering 150 mm, resulting in a displacement of 7069 cc. This model received the nameplate ss and like its predecessors was available as a complete cycle fender racing car or as a rolling chassis for coachbuilders to body. Caracciola continued his Nürburgring form by winning the German Grand Prix for sports cars on the legendary track with the new ss. Later in the year a shorter version was introduced especially for the popular hillclimb races; the ssK. Both cars were campaigned in the following years with considerable success in a variety of events and against machinery ranging from the nimble Alfa Romeos to the massive Bentleys. With a special lightweight version of the ssK, Caracciola scored the White Elephants' biggest success by winning the 1931 Mille Miglia. He was the first non-Italian to win the 1000 mile road race and did so in a record-breaking pace of 101.1 km/h. The advent of a new generation of lighter sports cars left the heavy ssK obsolete by 1930. Caracciola' s success in 1931 was very much down to his exceptional skill and the special ssKL he used. 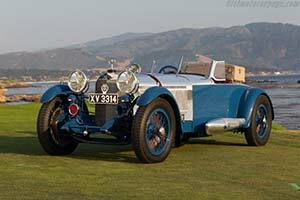 Due to economic crisis, Mercedes-Benz was forced to retire from racing at the end of 1931. At that point the German manufacturer had produced an estimated 33 ssKs and only a handful of ssKLs. Due to accidents in period a large number of cars were destroyed or scrapped and only very few have survived unscathed. Many of the salvaged parts have later been used for reconstruction and there are believed to be over a 100 ssKs in existence today, which claim to be built around original bits. The few surviving examples 'Mighty Mercedes' are understandably among the most desirable and valubale of all cars built by the German manufacturer.